During class I was taking notes using my tablet from Wacom. It has opened me up to the power of sketching as a way of exploring ideas and sense of diverse concepts or simply new ones. Recommended to anyone thinking of it, I am a visual thinker and so it is an ideal tool that makes me more efficient when taking notes or thinking about papers, coursework and even my to-do lists. Enough about that. While we where talking in class about coupling I was taking notes and tried to create a visual representation of the two concepts of loose coupling and tight coupling. As you see above, and I am open to corrections & suggestions, I have chosen a representation that simply uses distance between the nodes as the indicator of how loosely coupled units in an organization are. Without it being my intention the loose side had “less” of everything while the tight side has “more”. So the loose side is less interdependent, has a lesser need for co-ordination and not as much information flow between the units. And the opposite for the tightly coupled side. On thing that is not seen here is what it actually looks like inside these units and how the different parts interact between the units themselves. 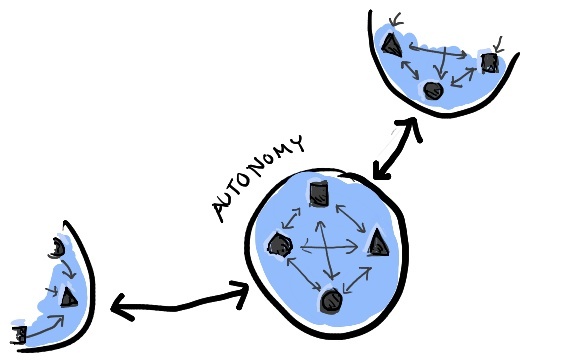 What I want to suggest is that the units can be seen as more or less autonomous (independent) so that the loosest side gives reason to think of these units within the organization as ecosystems. If it can be thought of this way what is interesting is how the internal workings are dependent on external input/output. Therefore a more “zoomed in” version was created to show these nodes as cell that can be either very autonomous or dependent on the others for “survival”. 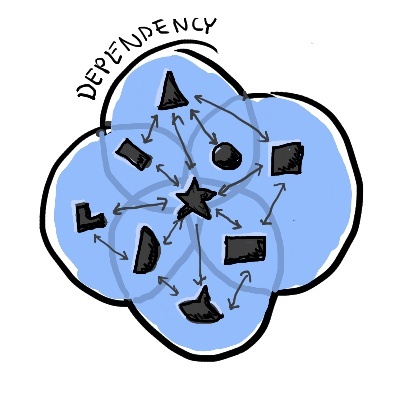 These nodes either share certain resources or not and actually this is one of the main ways of measuring the degree in which they are coupled. Here it becomes more clear how the different units or departments would fit together and the fact that if certain parts of one unit would fail that would severely impact the operational status of the other units. Good job Jeroen! Was reading about Wacom and it seems pretty interesting. I liked the way you have explained the concepts using diagrams and used distance between individual nodes as an indicator of how loosely or tightly the units are coupled in an organization. In my view, loosely coupled units do not have lesser need for co-ordination. Loose coupling just means that they are less dependent on each other; as you have mentioned, and don’t have any control over other units. I think there is substantial flow of information between the units regardless of how they are coupled. Its the controlling factor that determines whether it is loosely or tightly coupled. Loosely coupled don’t rely much on other units in contrast to tightly coupled ones as they depend less on their peer units. Here, a change in one unit usually does not force a ripple-effect of changes in other units. Also, tightly coupled units are more cumbersome to maintain and update as compared to loose ones because of obvious reasons of inter-dependency. It is interesting to think about what kind of coupling would be appropriate or work best for a particular kind of organization. A combination of loose and tight coupling having significant information flow accross units but no control over each other and are easy to maintain and update would be an ideal scenario. Pertaining information I believe that there is a difference in the information flow inside a unit ad between units. Tight couplig means that the information flow between the units is increased. But with loose coupling the information inside each unit can be huge while the external information flow has lessened. In an environment of tight coupling the difference between internal and external information flow becomes blurry. I real like your internal and external perspective for analyzing units in either loose or tight organization. It makes sense to me since the point could apply very well in programming too. While designing or coding a large-scale system, we strive for a loosely-coupled structure with indepentdent(high-cohesion) units so that changes and resouce-reuse could be convenient and effective. But in that case, I don’t see less information flow in the loose-coupled strcuture. As you said, low-coupling-high-cohesion means that a unit is robust and flexiable, and perhaps more units want to connect it and exchange information. In that sense, I assume more inter-connection in the diagram of loose structure (I mean the unit’s connection is not limited to its adjacent unit). Thanks for sharing your visualized notes. I also am a visual learner, and started sketching out some of the ideas from Roberts to get a better grasp on them. @Jeroen Thanks for this post. 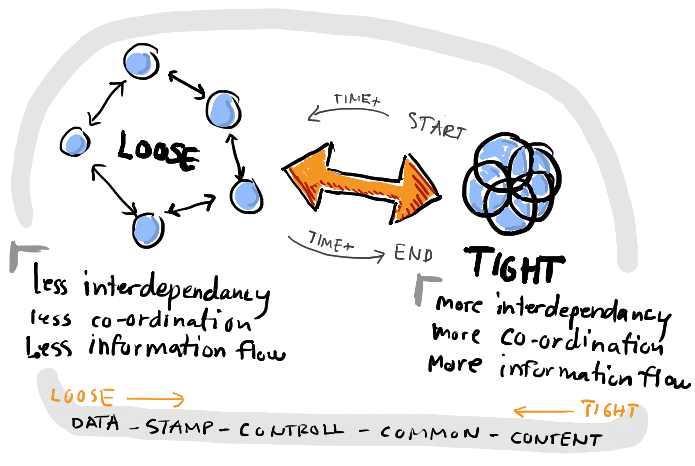 however i can’t understand “DATA – STAMP – CONTROLL – COMMON – CONTENT”, what does it mean? The day we have to “guess” others ideas, it usually means the ideas were not clear to the original author.